Formed from the ashes of Italian Doom band Saint Judas back in 2007 and after a difficult inception Turin’s Firelord emerged showing promise with their debut EP ‘The Burning‘. Finally those who have kept their eye on them will be pleased to learn they have finally put the finishes touches on their first full length effort ‘Among The Snakes‘. For those previously unaware of vocalist and guitarist Mario Bussini’s not especially merry men should know that Firelord play a heady mix of Doom and Stoner rock that calls on the influences of Black Sabbath and the likes of Monster Magnet, combining them in a high octane rock and roll that is heavy on down tuned riffing and big on atmospherics. ‘Among The Snakes‘ has everything that the band want to showcase on their EP cranked up to the clichéd 11; beginning with the almost standard and throwaway atmosphere building intro the band dive headlong into the frenetic rock n roll of ‘Man Of Mayhem‘ which has deft flourishes and distortion laced vocals. Whilst it is not a tune that will change your life, it is an attention grabbing shift with enough catchy high points to make you sit up and pay the band attention as they sway between the rolling tilt of Stoner Rock and the harder edge of their sound, kind of like a baked Dave Wyndorf covering Motorhead with it’s retro 70s throw back vibe. Follow up ‘Black Kommander‘ shows just what the band can do when they truly fire on all cylinders. More up tempo than the opening track, it cranks the tension further and carries the intensity onwards and upwards with Giulio Buscaglione (drums) and Mario Pappano (bass) working hard to allow Mario the space to lift the track beyond the run of the mill. At the risk of dropping another name, this is the kind of belligerence that Orange Goblin have been so successful at creating throughout their career, but just when you think you have Firelord pigeonholed, they drop in a spacey, almost drone like musical passage, heavy on the effect laden guitar, creating a swirling, other worldly feel before racing for the finish line. This is definitely one of the highlights of the album. The eleven minute, epic centre piece of ‘The Ghost Of Eymerich‘ is another stand out. Juxtaposed with the previous track this is built slowly on plodding Doom but breaks out into a multitude of great ideas and impressive vocal delivery, challenging you to depart from what has gone before and surrender yourself to some well crafted song writing full of great ideas and mesmerising, despite its length. Of the next two tracks ‘The Road To Hell‘ and ‘Werewolf‘, the former is a good solid mid tempo number full of groove and a bluesy feel that is reminiscent of the desert rock scene without being plagiaristic. It feels like a bit of a come down following the two strongest songs on the album, but it is a decent addition that would have sat better next to the opener. ‘Werewolf‘ however, is competently executed but a little forgettable if I am being honest. Track 7 of ‘Among The Snakes‘ is a faster than the original cover of ‘Children Of The Grave‘ by the one and only Sabbath. Now it is almost de rigour for a band of this genre to throw in their own take on a version of a classic by the masters of metal and as such seeing the name on the running order almost makes me wince before it plays. The problem with covering such a well known song is that unless you add something new, play out of your skins or even channel the horned one himself, it is only ever going to seem second best. I am sure the band have a lot of fun playing this in a live arena to a hyped up crowd, but on an album it is only ever going to seem like an after thought. Fortunately they close out ‘Among The Snakes‘ with the massive title track reminding everyone what is good about what they do – huge Doomy walls of sound collide with deep, rich blues grooves, overlaid by soaring vocals. 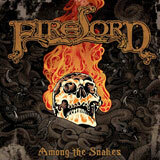 When Firelord hit their stride they are a force to be reckoned with. ‘Among The Snakes‘ is a promising debut that has felt like a long time coming for fans of the band and as such it doesn’t quite always hit the dizzying heights that you would hoped it would, but by the time they have toured the hell out of it, most of these songs will be killer live and set them up nicely for album number two.